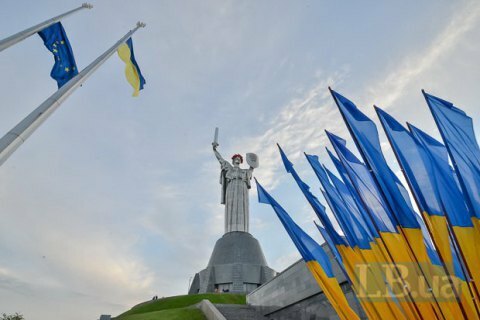 Some 58.5% of Ukrainians believe the country should join the EU, according to the September 2018 opinion poll by the Gorshenin Institute think-tank. The survey was held among 2,000 respondents aged over 18 in all regions of Ukraine, bar the occupied areas of eastern Ukraine and Crimea. The margin of error does not exceed 2.2%. Its findings were presented during the X National Expert Forum held by Gorshenin Institute in Odesa on 18 October. The nationwide poll showed that 10.5% of the respondents said they would prefer Ukraine's membership of the Customs Union of Armenia, Belarus, Kazakhstan and Russia. Some 23% of the respondents said Ukraine should not get close either to the EU or to the Customs Union, while 7.7% failed to answer. The figures have not changed much since May 2018 when Gorshenin Institute last held a similar study. At the time, 57.4% of the respondents spoke in favour of EU integration, 10.3% would choose the Customs Union, 24.3% wanted neither the EU nor the Customs Union, while 8% failed to answer. The share of EU integration supporters reached its peak in the second half of 2014 amid an escalation of hostilities in eastern Ukraine. According to a study by Gorshenin Institute at the time, 63.6% of respondents selected this option. The figure went down to 51.6% in the first half of 2017 but then went up again. According to the same study, 50% of Ukrainians would vote for the country's NATO membership had the referendum been held around that time.